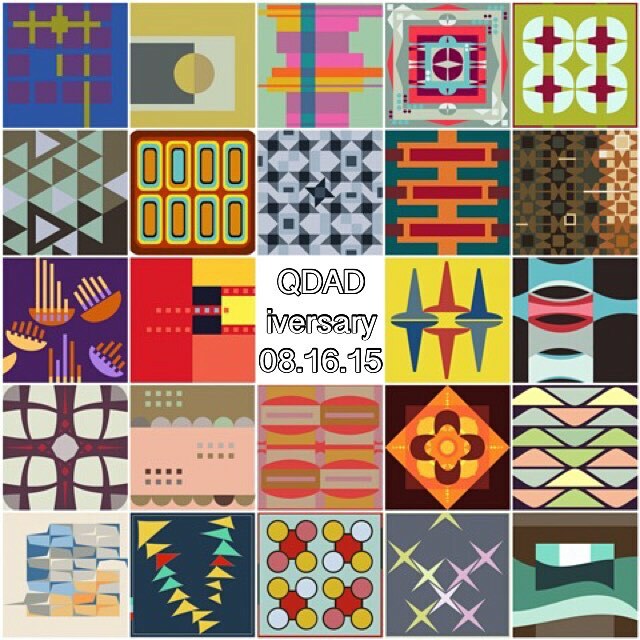 On occasion, QDAD (Quilt Design A Day) will have a challenge week. Today wraps up Emotions. Surprise/Aqua: "Unexpected", When unplanned things fall into place. Fear/Red: "Closed" The fear for others, the fear of the uncontrollable, the fear that the fear is not real and the fear that it is. Joy/Blue: "From Within" enough said. I hope that members will continue to add designs because I like seeing them and reading the message behind the design. 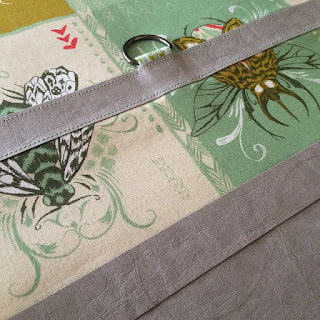 For the month of September, the mission for BeeSewcial is sort of of related. 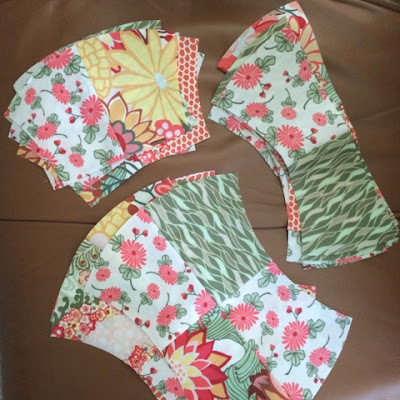 Check out Hillary's post at Entropy Always Wins and #inspiredbybeesewcial on IG. There are a few ideas in my head and the black and white palette will be a refreshing change. 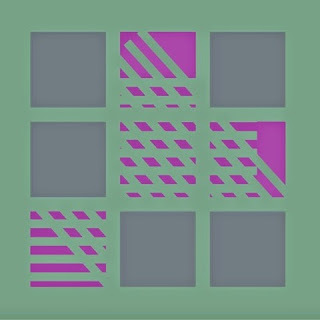 I am anxious to see if I can pull off combining a couple of construction techniques that are newish to me. 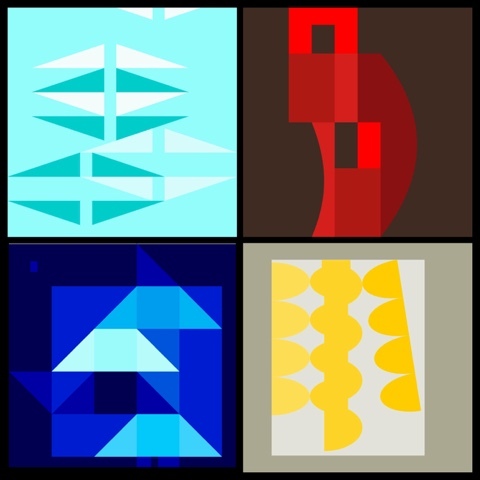 QDAD has helped me to edit and lean towards modern minimalism but it does not come naturally. I forgot to share. I'm not very good at keeping secrets but this time I was so good at it that I almost let it slip by without posting. 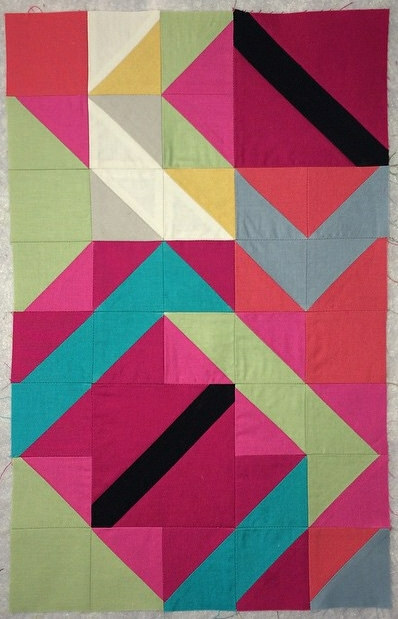 This little quilt was made to welcome a special baby girl into the world. Made with the apple core template and stash using Tokyo Rococo to build off of. 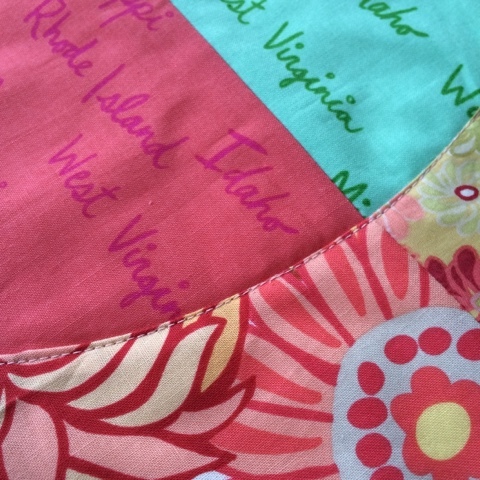 I'm always pleased when my fabric plays well together. I even busted into a long abandoned UFO for some Chic Blooms to add a scattering of yellow. If these process pics seem a bit familiar it's because I did give a sneak peak of the project on the apple slices tutorial (which may be why in my head I thought I had already shared). 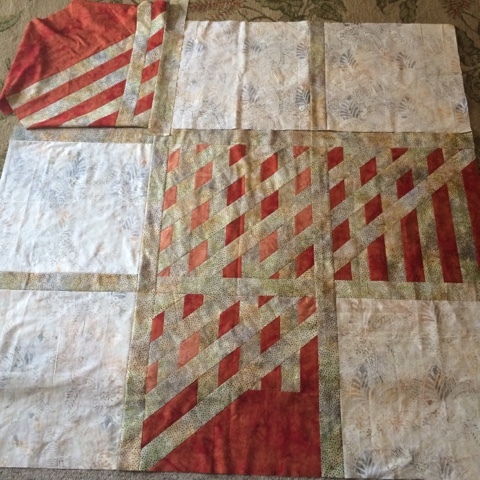 For quilting I kept it simple with some top-stitch and channel. 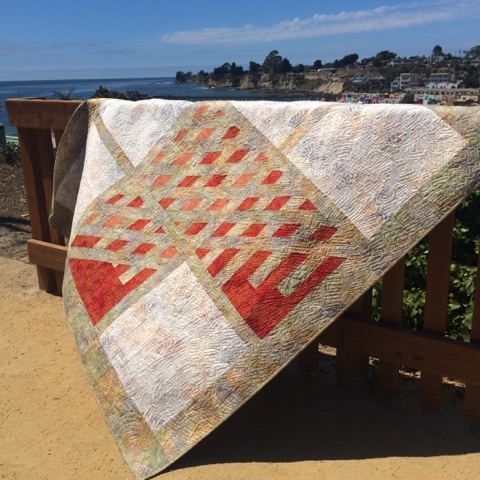 It was refreshing to not be free-motion quilting for a change. 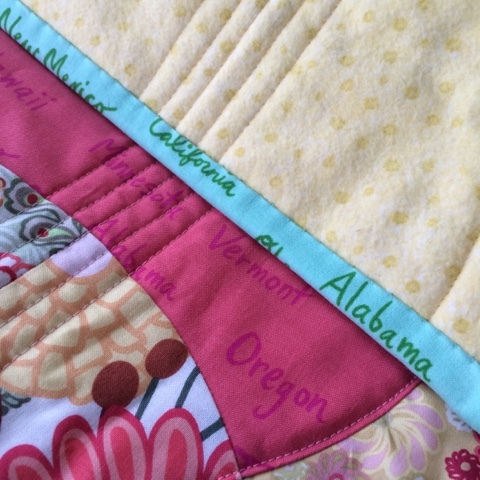 Had I planned a little better I would have centered "California" on the binding but I did make sure it was somewhere to be found. Flannel backing for baby - well of course. 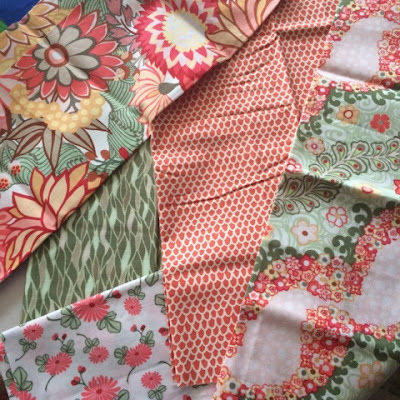 Linking up to Finish It Up Friday with Crazy Mom Quilts. 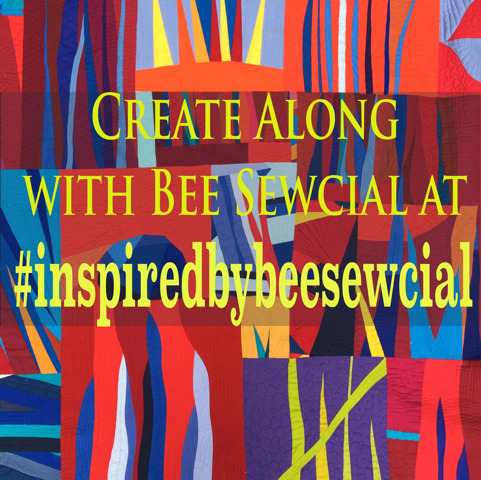 Unable to keep a good thing to ourselves, we have created a companion community #inspiredbybeesewcial to sew right along with us. We will continue to post our monthly inspiration on IG with dual hashtags. We ask only that you use #inspiredbybeesewcial when you post your makings. This larger group #inspiredbybeeswecial is about being a respectful, supportive, creative, collaborative community and making ourselves better designers and sewists. If you would like to be part of this companion community, you may follow monthly "instructions" on our blogs and tag your pictures on IG with #inspiredbybeesewcial. You will find us commenting on all your creativity over in #inspiredbybeesewical creative space. So, are you ready? Hillary @entropyalwayswins is point for September. Look for her mission to us all in the last week of August. The other co-conspirators (and people you might want to follow just so you don't miss anything) are: Leanne @shecanquilt, Debbie @aquilterstable, Diane @ylmommyx4, Marci @marci_girl, Felicity @felicityquilts, Karen @capitolaquilter (that's me), Kari @quiltsforthemaking, Melissa @weshallsew and Stephanie @spontaneousthreads. I joined a the bee a bit after things got rolling but you can read about the block inspiration for January on Stephanie's blog here. 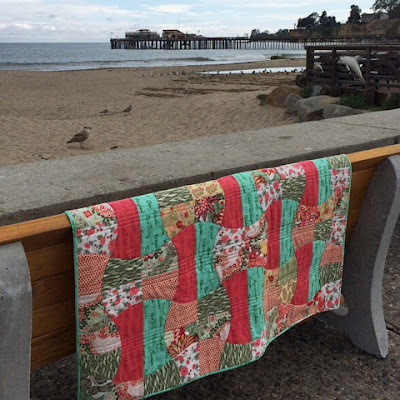 I'm looking forward to making the blocks for Hillary, Felicity and Leanne and feel very fortunate and honored to be among such an amazing group of quilters in this bee. I'm looking forward to seeing what shows up in the #inspiredbybeesewcial IG feed aren't you? A few of my favorite Quilt Design A Day designs. It's funny how emotionally attached I can get to some and how certain concepts are still trying to materialize. 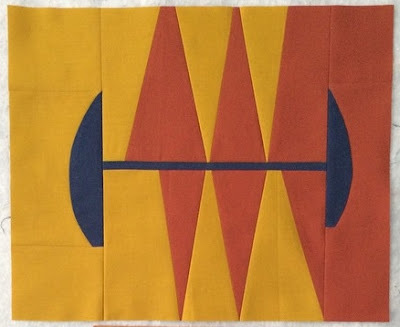 I've added a QDAD page to the blog. 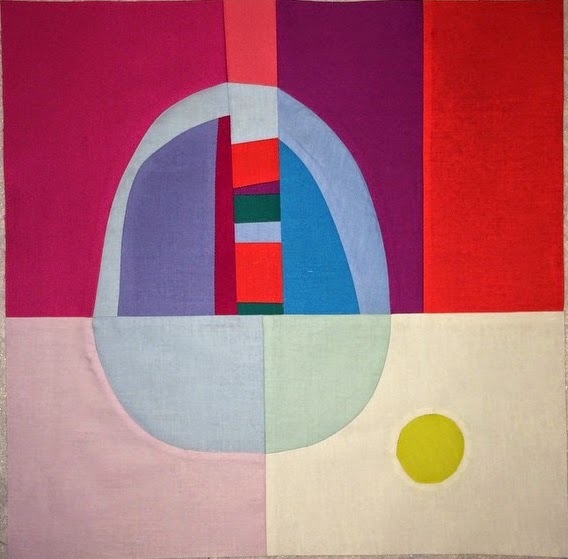 On the topic of Design, have you been following Anne's new series Color Clinic at PlayCrafts? 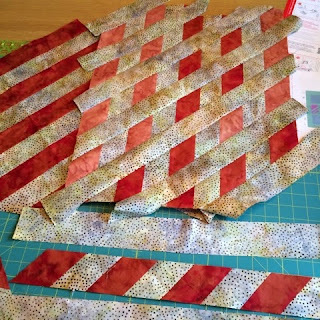 With so little time to keep track of blogs I've signed up to receive her newsletter by email just like I recently subscribed to Scrap Basket on Debbie's blog A Quilter's Table - check them both out! 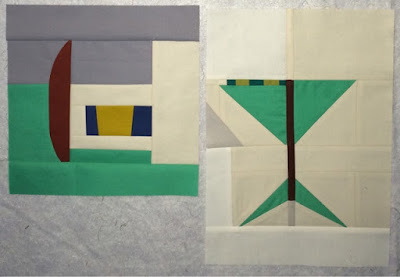 Last Call 9"x9" and 9"x12"
These four blocks are from the Mid-Century Modern challenge for Debbie A Quilters Table who was our queen for BeeSewcial in June. They aren't tardy - I just found my partially written draft and realized that I never actually published it. You may recognize them from my IG and flickr but I wanted to follow up on this earlier post with the extra inspiration of the mural. I pretty much came home that day and started creating. I used the same fabric in both with two different blues for the accent element. Hopefully having the option of placing blocks that are directly related in more than one area of her bee quilt might be helpful with the layout. I've seen on other swaps that some people get possessive about what they send but I'm happy to say that how - or if - the blocks are incorporated into the final vision is totally up to the queen and I'm good with that. 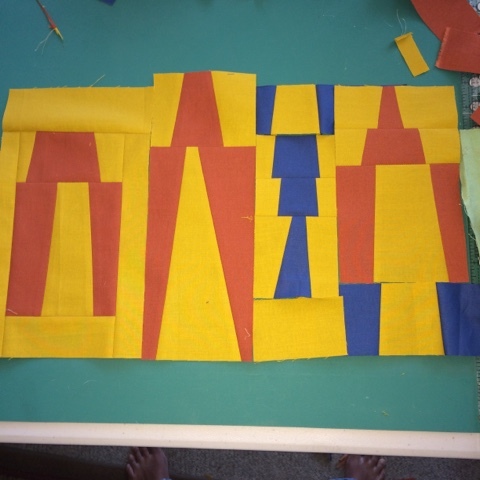 A note about my process: I finished the two mustard/rust/blue blocks and could have shipped them off right then. They met the criteria and incorporated design elements from her Pinterest board. 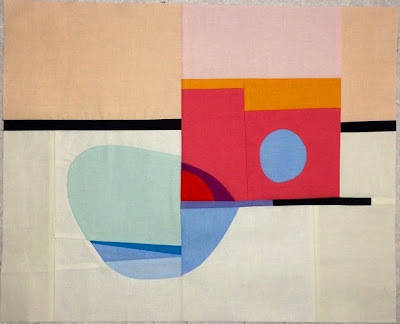 But because I hadn't worked through all of my ideas and concepts they felt incomplete. I kept going and made the two shown at the top of the page. The martini glass is my favorite despite the olives and glass stem taking on a bendy-straw life of their own. The other started out as a shot glass and became a filing cabinet drawer - which is perfect for time period I think. 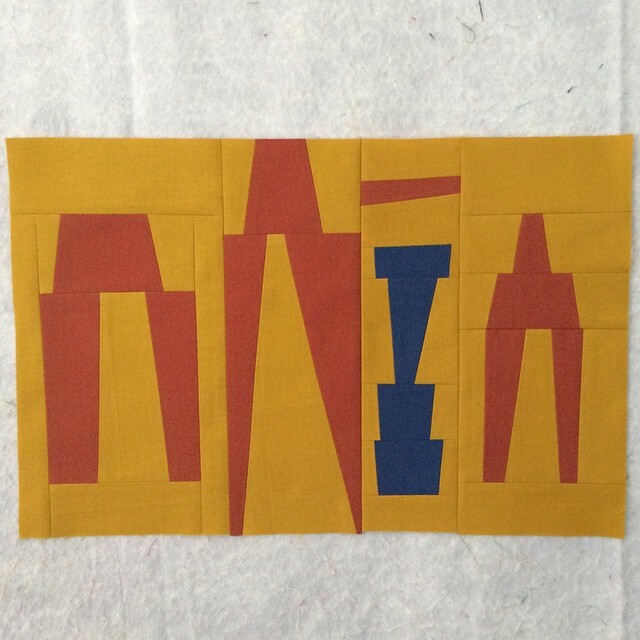 Lots of auditioning of fabric placement and shape options went on- that so much fun. 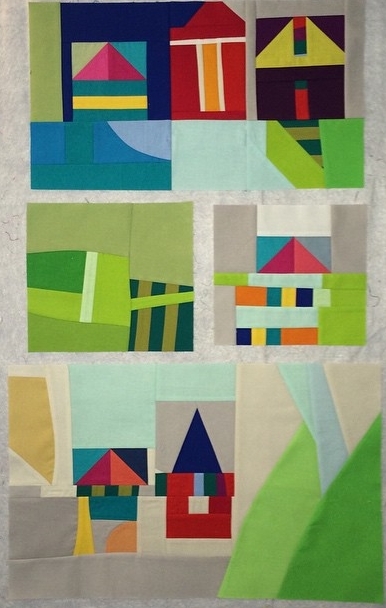 Next up will be the sharing of the BeeSewcial blocks that I've received as queen - they are amazing. Finally a finish. A very first QDAD brought to life or as Anne so cleverly dubbed the event #QDAD2REALITY, a hashtag I plan to use again soon. Collaboritve projects hold a soft spot in my heart and they are worth the extra time and effort of juggling schedules and hauling supplies back and forth. This one was started at the first of the year with my friend Sue. 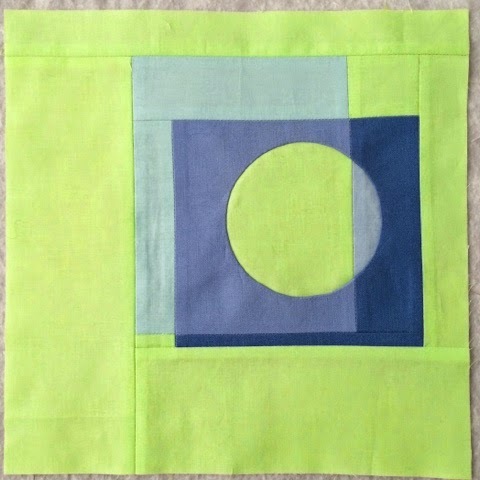 We wanted to sew an original pattern and thumbed through my QDAD (quilt design a day) folder on the computer and chose this one - a simple sashed nine patch, right? We auditioned fabric from my batik stash and began strip piecing. In my head, it was going to be a slice and insert method that wasn't time consuming or confusing. 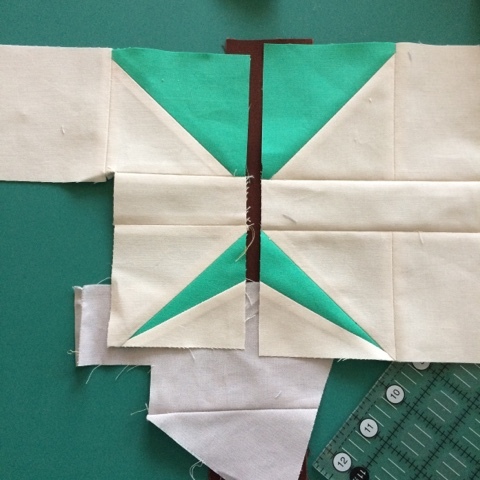 In reality, we had a lot of laughs (mostly at ourselves) because diagonal alignment is a bit more challenging when you factor in seam allowance and the spacing from the sash let alone the bridge from one square to the next. The final block layout as you can see from the original was swapped around but the overall essence of the design rings true. The FMQ was laborious and I'll just say it - frustrating. Fortunately the texture even before it's washed was worth it. For the longest time this project was my ALYoF goal rolling over month to month. On Monday I brought it to the UFO show and tell at PVQA's guild meeting where about 30 members who had pledged to finish and share did just that. A really inspiring parade of talent and stories. 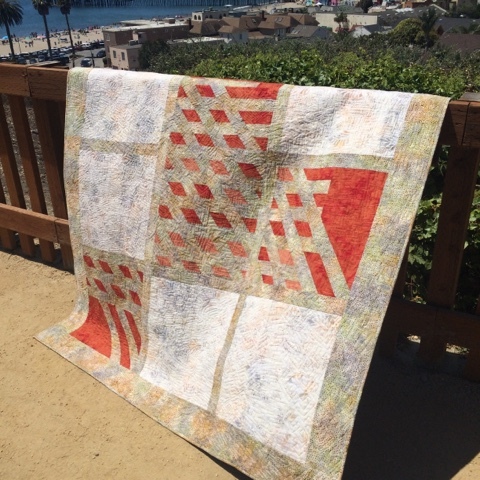 Linking up to Finish it Up Friday with Crazy Mom Quilts. Keep an eye on the blog tabs because I plan to celebrate my one year QDADiversary by adding a gallery of favorite designs to help motivate me to bring more of them to life. What I've been up to lately - clearly it hasn't been blogging! Fortunately it has been sewing. Some secret and some not. 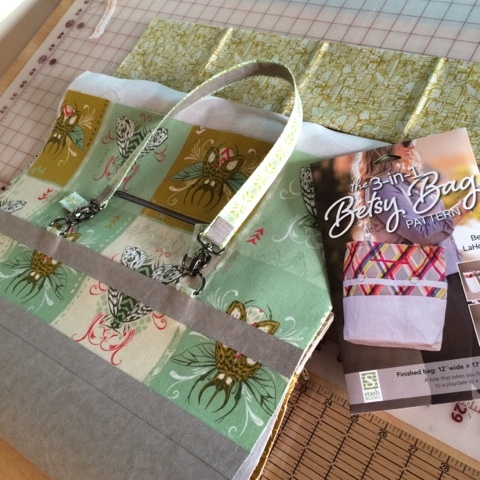 I'm loving the progress on my 3 in 1 Betsy Bag. The kraft tex has been really easy to work with. 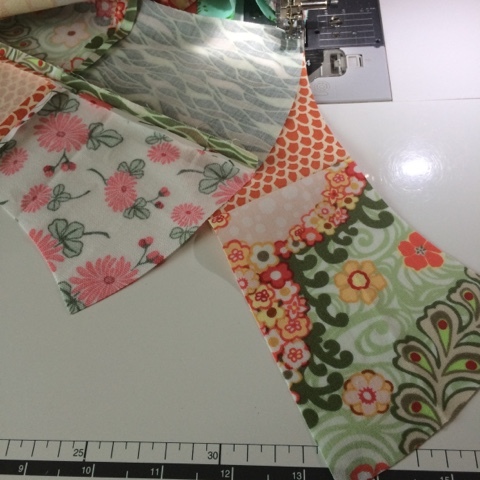 The process has been slow and I've decided to alter the pattern to include a recessed zipper closure instead of the drawstring. I just couldn't stand the idea of squishing my bugs!